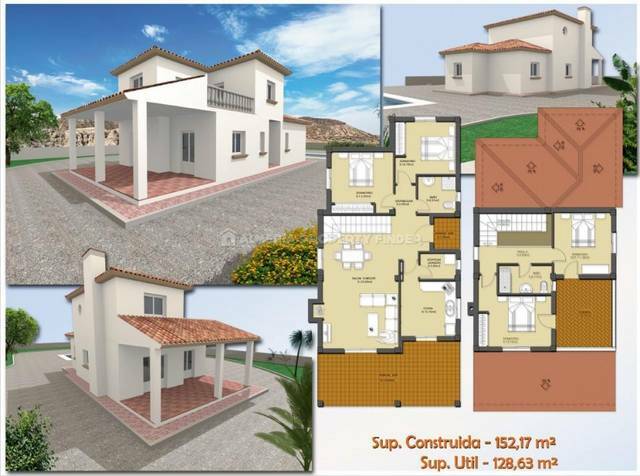 4 bedroom 3 bathroom detached villa in Palaces, Zurgena measuring 150m² on a plot of 894m² with bespoke 10 x 5m pool. This villa is located in the Palaces area of Zurgena, a traditional Spanish hamlet offering peace, tranquility and great rural views. Zurgena village centre is just 5 minutes away by car and access to the main motorway is quick and easy, making both Almeria airport (55 minutes) and Murcia airport (1 hour 10 minutes) easily accessible. The plot size is 894m² and the villa measures approximately 150m². The property was built to a high standard and includes many striking features. The main house is set on one floor with a feature spiral staircase up to an additional guest bedroom with en-suite bathroom. This bedroom boasts free standing wardrobes and hot & cold air conditioning. On the ground floor is a spacious lounge/diner with a feature fireplace and air conditioning. The dining area is open plan to the modern kitchen with all appliances and a door out to the rear terrace facing the pool. Also on the ground floor is a large master bedroom with fitted wardrobes, air conditioning and an ultra-modern en-suite shower room. There are also two further bedrooms, one currently used as an office and the other an ample double bedroom. These are both pre-installed for air conditioning. The ground floor layout is completed with a family bathroom. The outside space of this property is very impressive. The rear garden is perfect for enjoying the summer sun or entertaining family & friends, whilst the huge rear covered terrace offers much needed shade. The private pool is a bespoke 10 x 5m shaped pool with a pebbletech finish for less maintenance. The pool is surrounded by terracing and bordered with mature greenery. There is also a metal storage shed and plenty of mature fruit trees & plants to the front and rear. The list of extras with this delightful home is considerable; such as air conditioning to the master bedroom, guest bedroom & lounge, satellite TV, fitted wardrobes, vanity units & upgraded bathrooms, upgraded windows & doors, security rejas and landline phone line. To summarize, this is a stunning luxury villa, well-located and offering both size and space. This home has to be viewed to be appreciated.